Customs officials found the parts in cardboard boxes on August 13 in the cargo terminal of the capital's airport, said Abdul Kadir Abu Hashim, head of Malaysia's wildlife department. 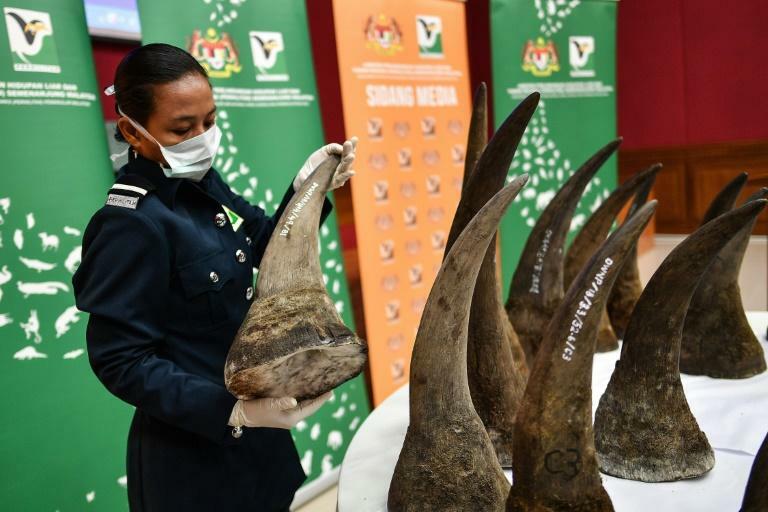 The 50 rhino horns weighed 116 kilogrammes (256 pounds) and are worth about 50 million ringgit ($12 million), he told AFP, adding that the seizure was "the biggest ever in (Malaysia's) history in terms of the number of horns and value". Vietnam is a hot market for rhino horn, which is believed to have medicinal properties and is in high demand among the communist nation's growing middle class. Officials also found a huge stash of animal bones -- believed to be from tigers and leopards -- in the same shipment, with an estimated value of 500,000 ringgit. Elizabeth John, from wildlife trade watchdog Traffic, described the rhino horn seizure as "staggering" and urged authorities to track down the people behind the smuggling attempt.